Team Suzuki Press Office – June 15. 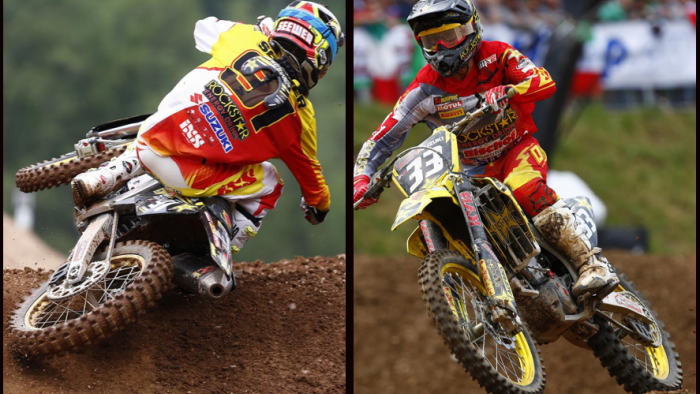 The Grand Prix of Italy was the scene of a positive double top-10 showing by Rockstar Energy Suzuki Europe in its assault on the MX2 class of the FIM Motocross World Championship as Jeremy Seewer took his works RM-Z250 to seventh overall while Julien Lieber was 10th at Maggiora, north west of Milan. After a busy weekend at the second round of the ADAC MX Masters championship in Austria, the team regrouped for its 10th GP of the campaign around the steep hills and hard-pack of the mythical Maggiora layout. Seewer also made the short journey across the border from his native Switzerland having completed his mechanical studies and examinations this week. The 19 year old newly-turned ‘Pro’ performed with gusto in front of a 35,000 crowd in two dramatic motos. The first sprint saw a scary multi-rider crash on the first uphill with Seewer at the centre of the carnage. Luckily the Swiss was not hurt and quickly recovered the RM-Z to begin a comeback charge. He regained ground and positions with aplomb to reach the top-10. The second outing was more straightforward and a lively launch from the start gate put Seewer on the edge of the top five. He resisted the challenge of Arnaud Tonus and Tim Gajser for long stretches of the moto but eventually crossed the line in an encouraging eighth spot. Lieber again experienced ranging luck. The Belgian was part of the same tangle in the first moto that claimed his team-mate and his progress was almost as eye-catching as he worked back to 13th. In the second he was also near the front – inside the top-10 – to give both distinctive yellow and black Rockstar bikes a healthy presence at the ‘sharp end’. The ‘#33’ rode out the race distance among the leaders and captured ninth position to go 13-9 on the day. In total Seewer bagged 24 points at Maggiora which elevates him to 10th place in the MX2 World Championship table in what is his first full-time Grand Prix year. Lieber currently stands 14th. Rockstar Energy Suzuki Europe can now look towards its home event at Teutschenthal next weekend as FIM MXGP heads to Germany and for the last fixture of the month.